1994 palomino overo Pleasure Type Pinto stallion. 100% morgan, however cannot produce registered morgans due to previous AMHA color rules. Bloodlines include Buzz, War Paint and Windcrests Donfield. Bred by Pegasus Farms. 1996 chestnut tobiano Pleasure type Pinto Stallion. Champion producer. Currently unshown, bloodlines tracing to Wham Bam Command, Nabeg and Flashy's Enchantor. Bred by Double Hart Ranch/Cory Hartung. 1985 Palomino overo/sabino Pleasure Type Pinto mare. LS Winner. Catala is 100% morgan, however due to previous AMHA white rules could not be registered. She CANNOT produce registered Morgan foals. Bloodlines include War Paint 2x, Lippitt Ethan Ashbrook and Chingadero 2x. Bred by Rocket City Stables. OPEN: 90, 91, 92, 93, 94, 95, 96, 97, 98, 99, 00, 01, 02, 03, 04, 05, 06, 07, 08, 09, 10 No foals after 2010, pensioned. 1986 bay tobiano Pleasure Type Pinto mare. 7/8 Morgan breeding. Unshown, but has excellent bloodlines! Traces to Stetson, Ashley DeBoyd and Lippitt Moro Ashmore. 1990 chestnut tobiano Pleasure Type Pinto mare. Unshown, royal bloodlines tracing to Vigilmarch, *Bask, Raseyn and Wind-Crest Donfield. Bred by Samantha Kroese/VnV Stables. 1999 red dun tobiano Pleasure type Pinto mare. Multi Champion, Grand Champion Halter mare. Sire is Morgan of Goverment breeding, dam is 96% arabian of CMK/Polish breeding. Bloodlines trace to Windcrest supreme, Heresy, Gamaar and Ivanhoe Tsultan. Bred by Foxfire/Double Hart Ranch. Lippizan naming rules dictate the colts be named with the sires’ family name (IE Favory, Conversano, etc.) and the dam’s name. Multiple foals of the same bloodlines will have roman numerals added to the name. Filly foals will usually have single word names starting with the first letter of the dam’s name. 2006 grey (black) Stallion. Unshown. Sire is of Pluto and Conversano lines, dam is Pluto/Favory lines. Bred by Trish Yanko/Rivendale. 1990 grey Lippizan Mare. Unshown. Maestoso/Siglavy top lines, Maestoso/Pluto bottom lines. Bred by Cory Hartung/Double Hart Ranch. OPEN: 95, 96, 97, 98, 99, 00, 01,01, 02, 03, 04, 05, 06, 07, 08, 09, 10, 11, 12, 13, 14, 15, Pensioned. 1993 grey (bay base) Lippizan Mare. Unshown, good lines. 1996 grey Lippizan Mare. Limited showing with good results. Bloodlines Favory/Maestoso on top, Siglavy/Maestoso on bottom. Bred by Cory Hartung/Double Hart Ranch. 1993 bay Andalusian Stallion. Live Show Winner multiple times, nice model and real bloodlines. Bred by October Moon. 1994 bay andalusian stallion. Unshown, bloodlines to Bilbaino VIII and Hispano IV. Bred by Cindi Nakagawa. 1998 buckskin Andalusian (PRE) Stallion. Unshown. Bred by Cory Hartung/Double Hart Ranch. 1999 black Andalusian Stallion. Unshown, bloodlines tracing to Legionario III, Poseido III and Nedado III. Bred by Cindi Nakagawa. 1997 grey Andalusian Mare. Unshown, bloodlines to Bizarro IX, Poseido V and Gorron IV. Bred by Caballos Del Mar. 2007 chestnut Andalusian Mare. Unshown, Bloodlines to Jubiloso VIII, Don marco and Granadino XI. Bred by Caballos Del Mar. 1988 grey standard Donkey Jenny. Unshown, good bloodlines! Bred by Halo Ranch. 1990 grey Donkey Jenny. Live show placed. Bloodlines trace to model and real lines. 1997 grey Miniature Donkey Jenny. Live show winner. Excellent Bloodlines. Bred by Halo Ranch. 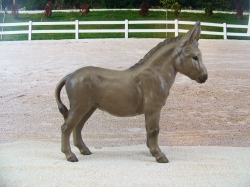 2001 grey Standard Donkey Jenny. Unshown. Bred by Halo Ranch. 1999 dun Fjord Stallion. Unshown, pedigree is mostly real horses.